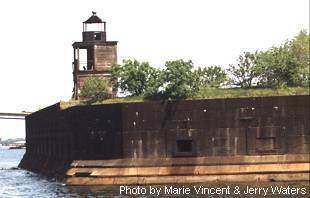 Fort Carroll Light was originally built on a parapet of Fort Carroll in 1854 with a sixth order Fresnel lens. The lighthouse and fog bell were removed in 1898 to make room for the fort’s expansion. A new light was constructed in December of the same year; a square wooden tower with black cast iron lantern with a fifth order Fresnel lens. What remains is the ruined square cylindrical frame tower from 1898. The fifth order Fresnel lens was removed. Fort Carroll and the lighthouse sit atop a man-made island in the middle of the Patapsco River. The hexagonal fort was built to protect the approach to Baltimore. The fort was abandoned after the end of World War I and the light was automated in 1920. During World War II the fort was used as a firing range and to house foreign seamen while their ships were fumigated. The light was deactivated in 1945. The fort was sold into private ownership in 1958. In 2000 a local developer signed a lease on the property; no purpose has been announced. Obviously endangered and in a state of decay, the light is on the Lighthouse Digest Doomsday List. Best seen by boat, Fort Carroll lighthouse can also be seen while driving eastbound on the Francis Scott Key Bridge on the southern side of the Baltimore Beltway (I-695). It can also be seen from Fort Armistead Park. To reach Fort Armistead Park, take Exit 1 from I-695 and follow Quarantine Road south to Hawkins Point Road. Follow Hawkins Point east to Fort Armistead Road, and follow Fort Armistead Road to the park.